Last week, I had the privilege to be in Istanbul: what an amazing city. Not only does it have an Asian and a European side, it has a fascinating culture weaving together history from Islam and Christianity. While I was there, a notable women died: Charlotte Haley. 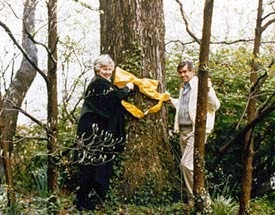 The first ribbon to be linked to a cause was a yellow ribbon. In the late 1970s, they were tied around a trees to highlight the plight of Iranian hostages. In1991, the red ribbon was created by a group of artists who designed a symbol to remind the world about the plight of AIDS victims. "The National Cancer Institute annual budget is $1.8 billion, only 5 percent goes for cancer prevention. Help us wake up our legislators and America by wearing this ribbon." Estee Lauder contacted Charlotte Haley and asked her if they could use the peach ribbon to increase breast cancer awareness and were told they could not. As a result, they used a pink ribbon. The most sobering aspect of the story is that whilst many billions of dollars have been spent on research into breast cancer prevention since then, only 5-10% of all women with breast cancer know why they have it. The cause of breast cancer in over 90% of women remains a mystery. Personally, I think 20 years on, we need to move away from the pink ribbon. What symbol should it be replaced with? This question of a new symbol for breast cancer has really taken a hold of me, with an afternoon of reflection and trawling the internet for inspiration, the following 3 options came to mind: the sunflower, figures standing in a circle holding hands, 5 hands holding each others wrist in a circle shape. A symbol that carries the message of community, support and connecting, using bright colours of awakening.